Don Tapscott and Anthony D. Williams. Macrowikinomics: nuevas fórmulas para impulsar la economía mundial. Barcelona: Paidós, 2011, 592 pages. Translated by Marta Pino Moreno. ISBN: 978-84-493-2564-9. 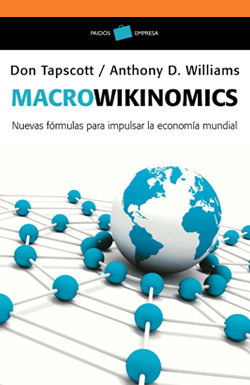 Spanish translation of the original title: Don Tapscott and Anthony D. Williams. MacroWikinomics. Portfolio Penguin, 2010. Published in Spanish by Paidós.